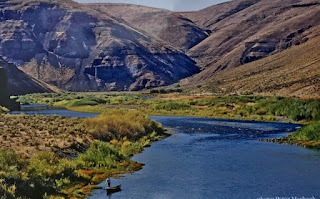 Today when we leave The Town of John Day Oregon, we will head east toward the City of Baker City Oregon. Before we leave Little iPhone wants to scout out the John Day River. We have never seen this river before. We have found that camping on the street on Sundays is very easy to do. It's that way where we are right now. In the Town of John Day at our Nite Campsite. We are in the driveway in the front of an industrial building. Because it's Sunday, nobody is working here. It's so very quiet now. It was quiet all nite long too. Small towns have little traffic. Very good for sleeping. This is a medium size town or small city. We were thinking of paying to use a fitness club. The club we went to was a Key Club. Members use a key to open the door. This club does not have employees working on Sundays. 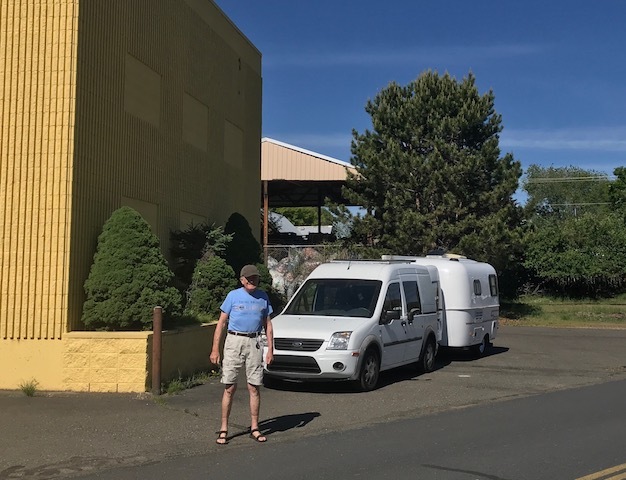 After buying a chamois at an auto parts store, we made an Afternoon Camp at the County Fairgrounds. Just returned from washing Scampy's left side. Tránsito's left side also. As you may have noticed, there is a certain sameness in our washing routine. This is intentional. Isn't this kind of sameness due to our discipline? And our commitment to a sparkly RV rig! After finishing today's washing, I went outside to take another look at the job I had done. Actually, I went out twice! A big joy for me is admiring my work! Although our T-Mobile signal has 3 to 4-bars [4 bars max], the data streams very slowly! So, we have tapped into the library WiFi. We weighed Scampy and Señor Tránsito today. I've been on interstate 82 and 84 driving back from Vancouver, B.C. to Phoenix, AZ on a two week vacation. Wow what a long drive that was round trip in two weeks! From Twin Falls, ID we took hyw 93 down into Las Vegas and lots of desert tortoise on the hyw. I'm now touring the area through your blog. Thank you. Are you a working lady? Still on the job? If yes, than when you achieve retired status, then you will be elevated to RVing as the Scampy Team RVs. Slowly, slowly we move along. We search for adventure along our way. But never are concerned when we find it! No I'm retired. The trip was made many years ago and we tent camped up the coast to Vancouver. We loved that trip. Are you continuing to RV? 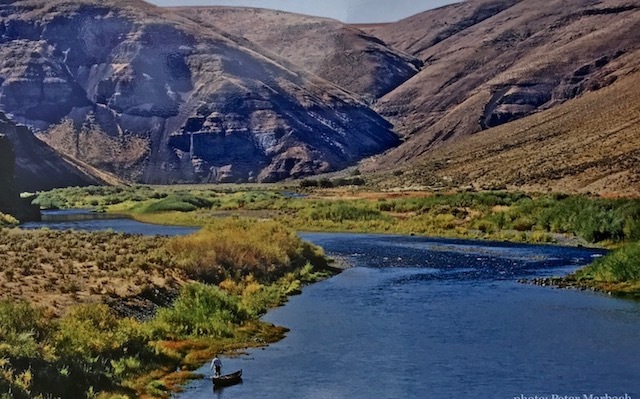 Beautiful picture of the John Day river! Did you read the caption under the picture? Little iPhone captured that river pic from a photo posted in a viewpoint. A fellow named Peter Marbach [Probably a professional] actually took that photos. I published a comment of yours which appears to have gotten lost! Blogger does lose comments occasionally. Your comment addressed the weight of Scampy & Tránsito.